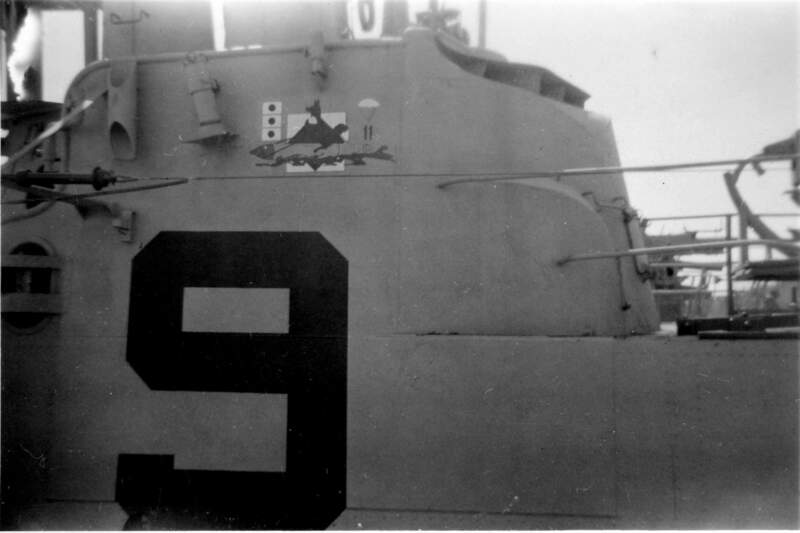 Patches on left & center courtesy of George M. Arnold, on right by Sait Kucuk, CPOS (Ret),Turkish Navy. 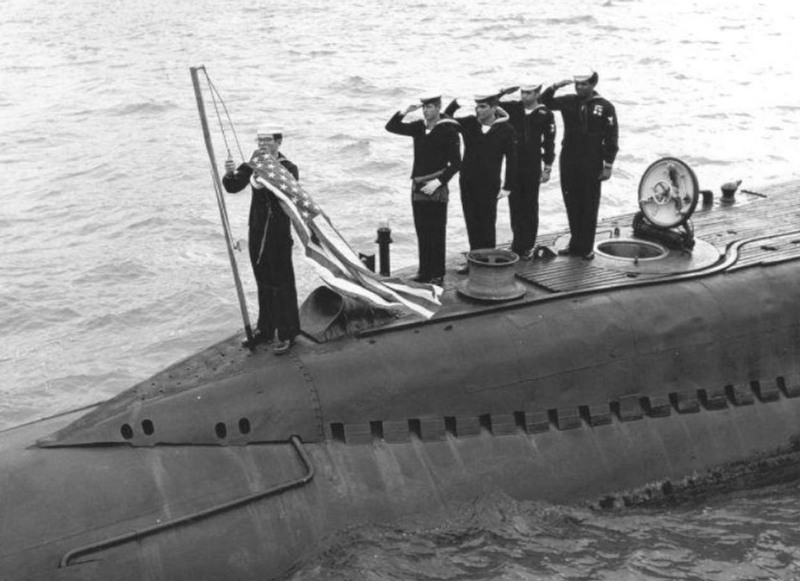 Balao Class Submarine: Laid down, 2 November 1943, at Portsmouth Navy Yard, New Hampshire; Launched, 28 March 1944; Commissioned USS Sea Fox (SS-402), 13 June 1944; Decommissioned on 15 October 1952 at Mare Island Naval Shipyard, Vallejo, CA for GUPPY IIA conversion. 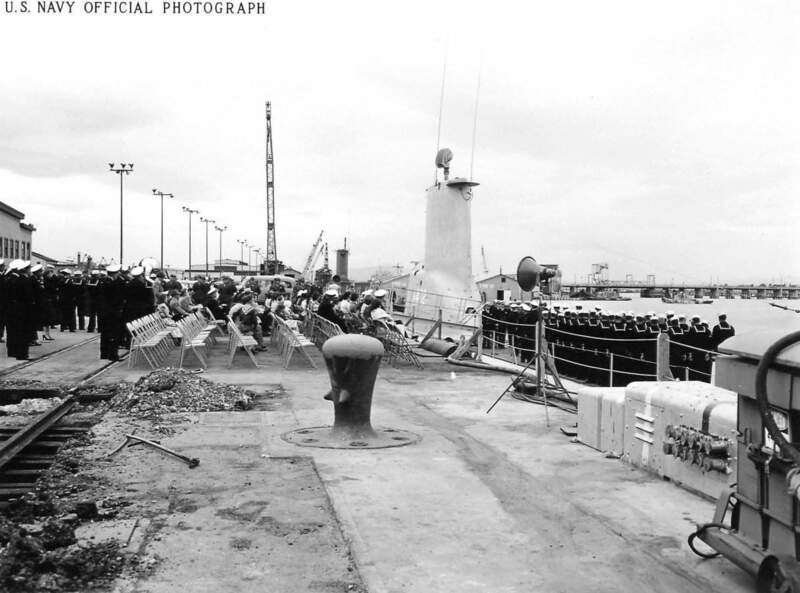 Re-Commissioned on 5 June 1953. 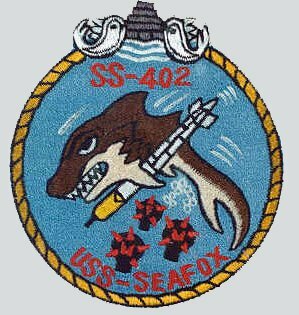 After more than 25 years of alternating Western Pacific deployments with the U. S. Seventh Fleet and local operations and training, Sea Fox (SS-402) returned from her final deployment to her homeport of San Diego on 11 October 1970. 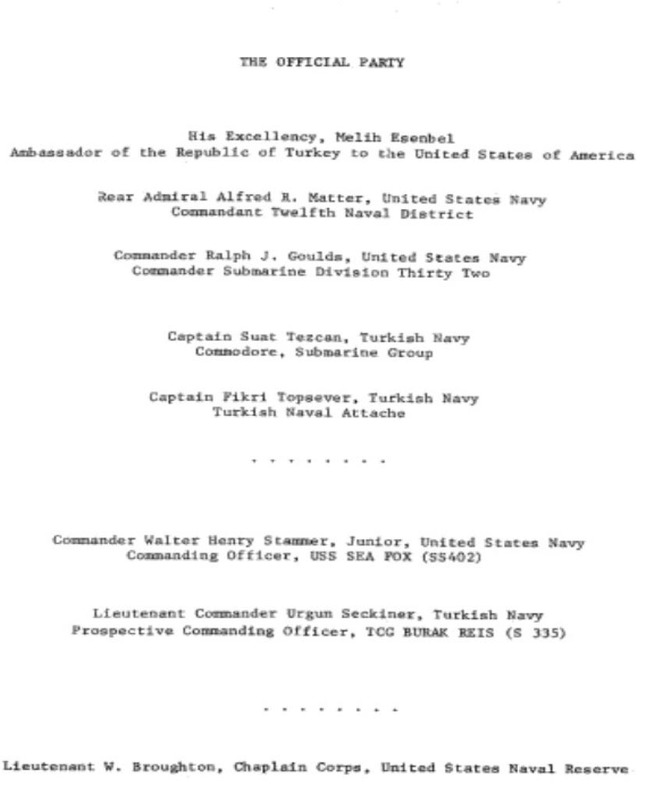 In November, she embarked the prospective Turkish Navy crew for training and departed for Hunter's Point Naval Shipyard at San Francisco pursuant to the provisions of the Foreign Military Sales Act of 1968. 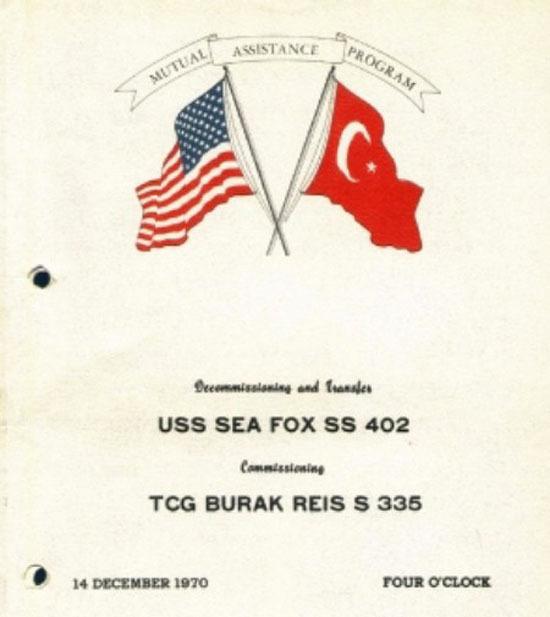 On 14 December 1970, (Sea Fox Decommissioned from the United States Navy; struck from the Naval Vessel Registry; transferred to the Republic of Turkey and concurrently Commissioned TCG Burakreis(S-335) (Note: Burak Reis was the 2nd submarine of the Turkish Navy to bear the name of the 15th century Commander of the Western Fleet of the Ottoman Empire Navy). 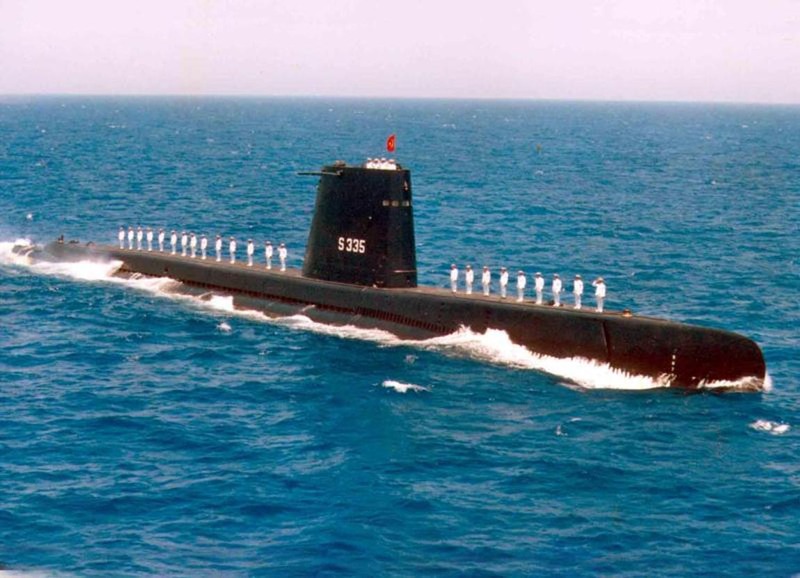 On 1 July 1996, TCG Burak Reis, (ex-Sea Fox(SS-402) Decommissioned from Turkish Navy and reportedly acted as a "charging boat" for other GUPPY submarines at Golcuk Navy Yard, Turkey until cannibalized for parts and the hulk discarded for scrap in 2003. 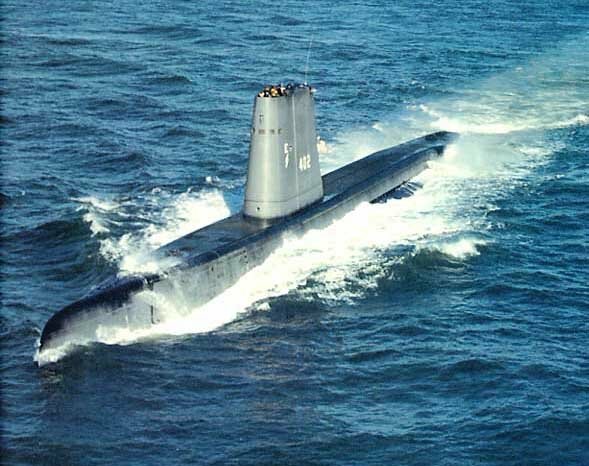 Sea Fox (SS-402) was awarded four battle stars for WWII service and another four stars for service in Vietnam. Researched by CTRC Donald J. Wagner, USN (Ret) for NavSource. Specifications: Displacement, Surfaced 1,526 t., Submerged 2,391 t.; Length 311' 9"; Beam 27' 3"; Draft 15' 3"; Speed, Surfaced 20.25 kts, Submerged 8.75 kts; Cruising Range, 11,000 miles surfaced at 10 kts; Submerged Endurance, 48 hours at 2 kts; Operating Depth, 400 ft; Complement 6 Officers 60 Enlisted; Armament, ten 21" torpedo tubes, six forward, four aft, 24 torpedoes, one 5"/25 deck gun, one single 40mm gun mount, one single 20mm gun mount, two .50 cal. machine guns; Patrol Endurance 75 days; Propulsion, diesel-electric reduction gear, Fairbanks Morse diesel engines, 5,400 HP, Fuel Capacity, 116,000 gal., four Elliot Motor Co. electric main motors with 2,740 shp, two 126-cell main storage batteries, two propellers. 32k Alopias vulpinus, known as the long-tailed thresher shark, or "fox shark", & "sea fox", among others. Courtesy of Evgeny V. Romanov & fishbase.org. 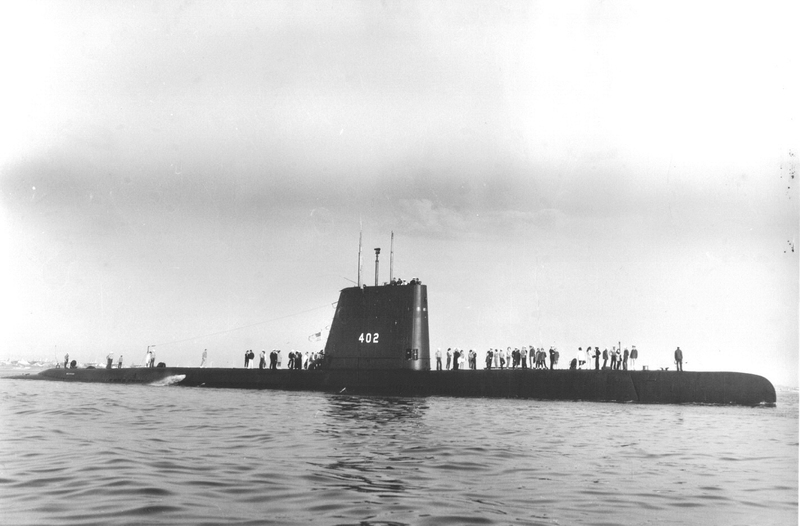 482k Double Dog Launching: Sea Dog (SS-401) & Sea Fox (SS-402). From left to right: Mrs. O.C. 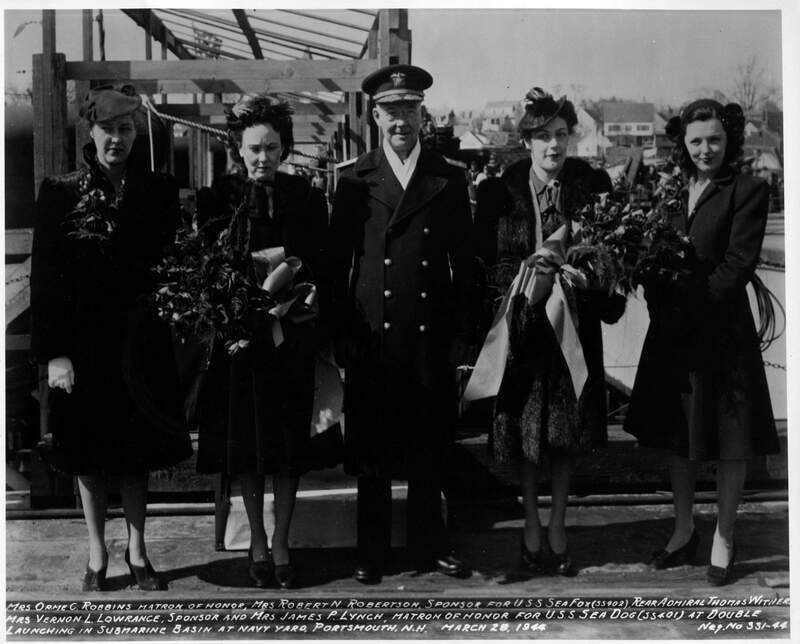 Robbins, Matron of Honor, Mrs. Robert N. Robertson, Sponsor for Sea Fox (SS-402), Rear Admiral Thomas Witner, Mrs. Vernon L. Lowrance; Sponsor, & Mrs. James P. Lynch; Matron of honor for Sea Dog (SS-401) at double launching in submarine basin at Portsmouth Navy Yard, New Hampshire on 28 March 1944. Photo courtesy of Lt. Francis Doerfler via Joe Pace. 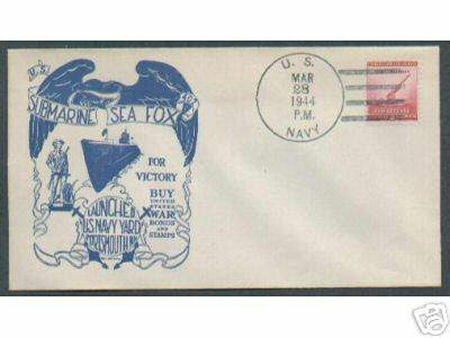 29k Commemorative postal cover marking the launching of the Sea Fox (SS-402), 28 March 1944 at Portsmouth Navy Yard, New Hampshire Courtesy of Jack Treutle (of blessed memory). 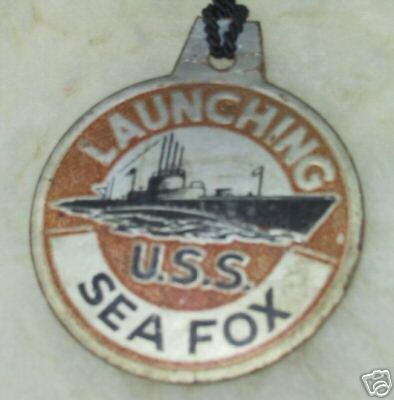 21k Commemorative medallion on the occasion of the launching of the Sea Fox (SS-402), 28 March 1944. Courtesy of Jack Treutle (of blessed memory). 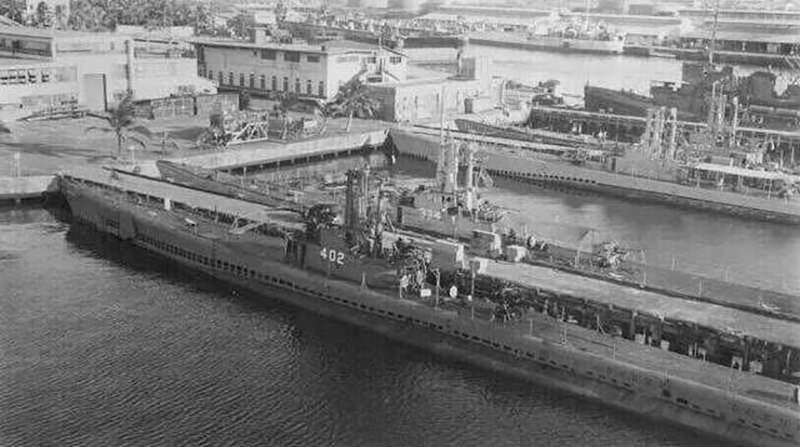 52k One month before commissioning, the Sea Fox (SS-402) lies out in Portsmouth (N.H.) Navy Yard, 16 May 1944. USN photo. 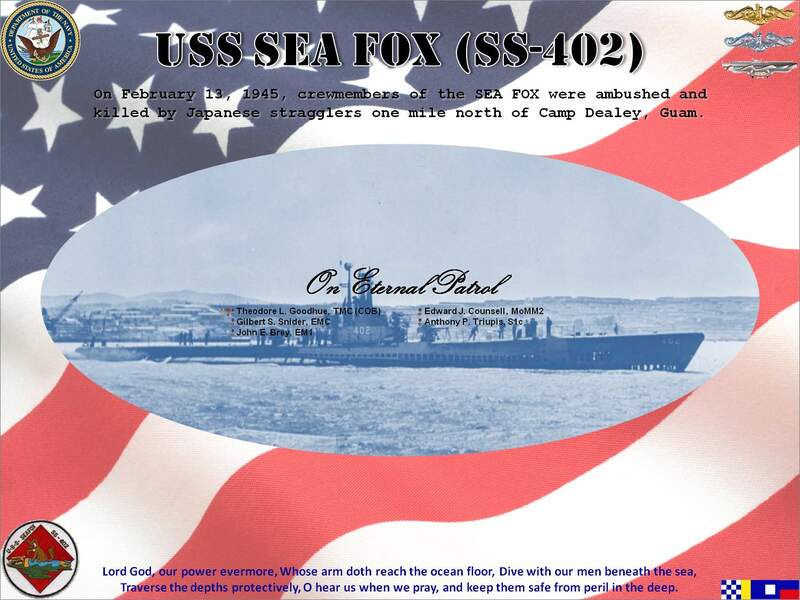 201k Commemorative photo honoring the memory of the crew of the Sea Fox (SS-402) K.I.A., One mile north of Camp Dealey, Guam, ambushed by Japanese stragglers on the island on 13 February 1945. Photo courtesy of Raymond Fritz. ET1(SS). 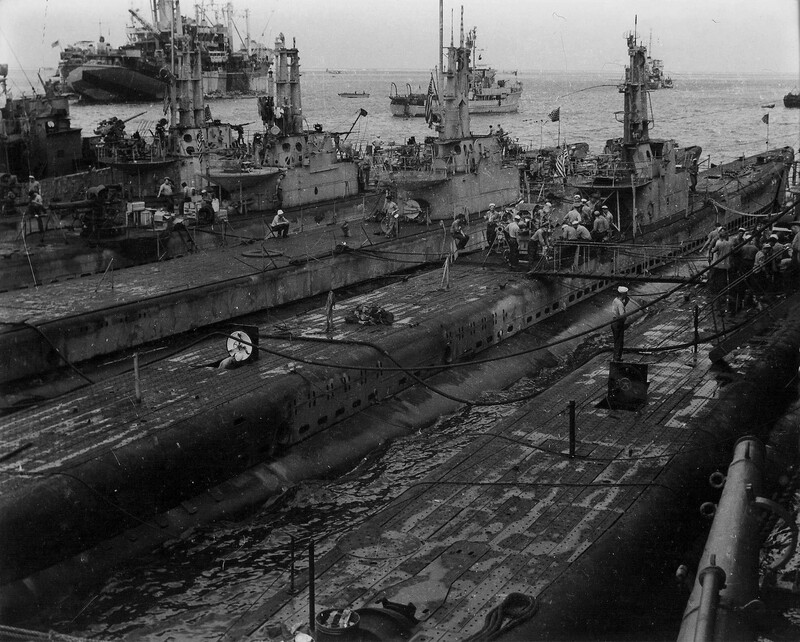 524k Spot (SS-413), Sea Fox (SS-402) & Queenfish (SS-393) & friends at Saipan, March 45. USN photo by Paul D. Guttman, courtesy of Robert Guttman. 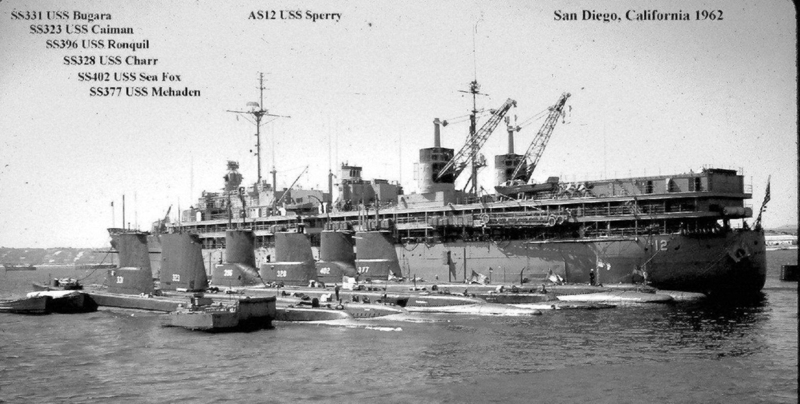 144k Sea Fox (SS-402) & Bumper (SS-333) nested at Subic Bay, Philippines, in September '45. Photo courtesy of Dan Goodell. 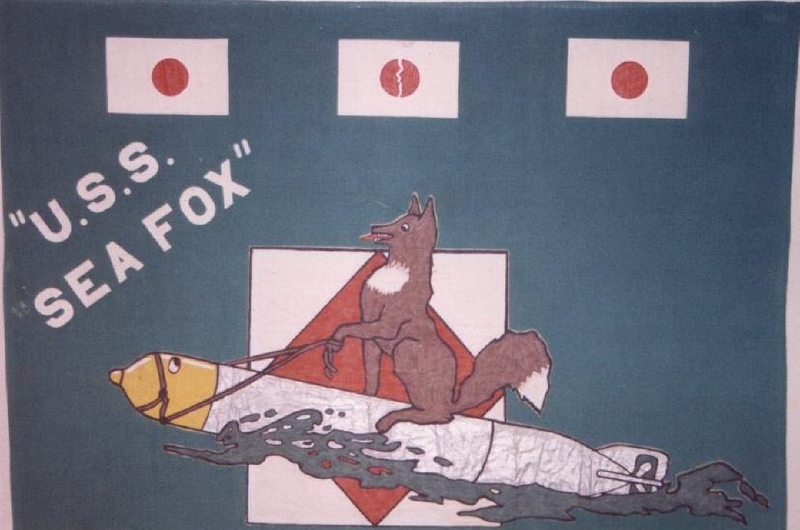 145k A closeup of the Sea Fox's (SS-402) sail showing her battle record (3 ships sunk, 11 aviators rescued) and the fox riding a torpedo. Photo courtesy of Dan Goodell. 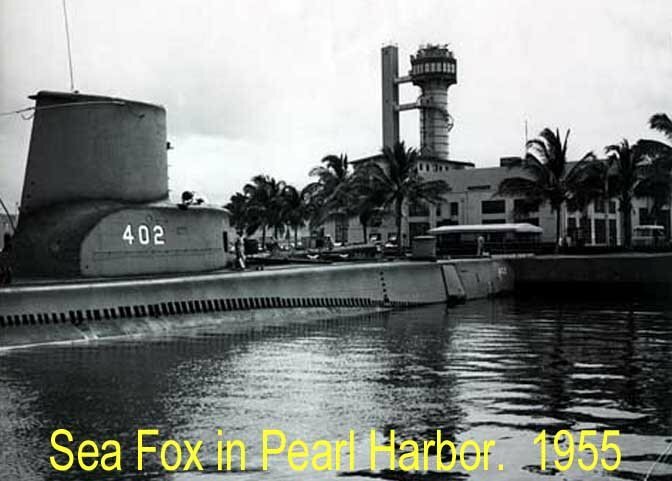 260k Cabezon & Sea Fox (SS-402) perhaps at Pearl Harbor sometime right after the war. Photo courtesy of John Hummel, USN (Retired). 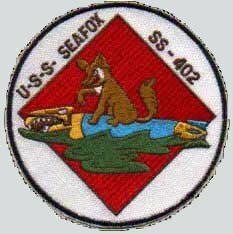 99k AAF Crew join the Sea Fox (SS-402). Photo courtesy of Y.M.Umar,CPO (Ret. ),Turkish Navy. 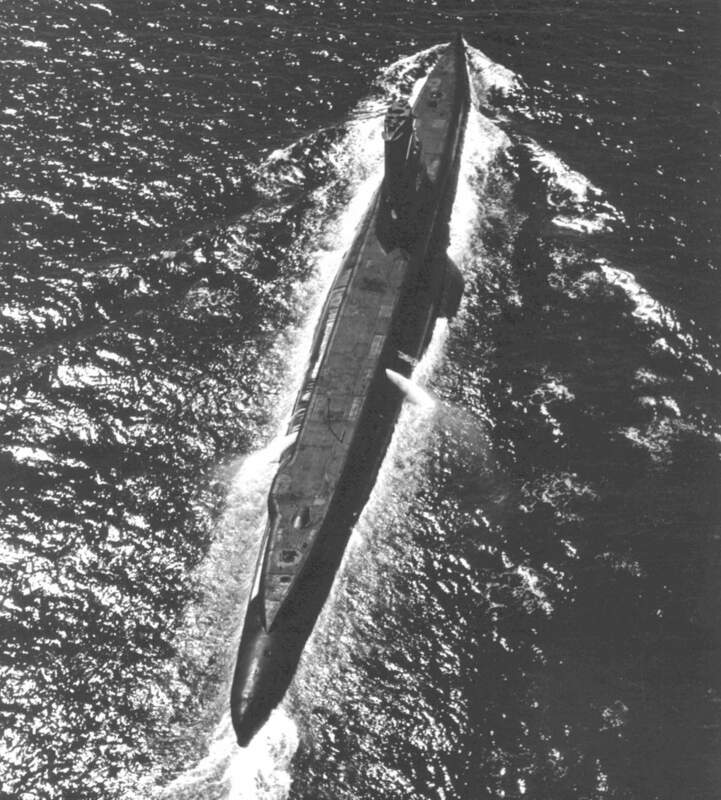 666k Starboard side view of the Sea Fox (SS-402) underway on 17 May 1946 off Hunters Point Naval Shipyard, San Francisco, CA. US National Archives photo # 80-G-1041911, from NARA, College Park, Maryland, courtesy of Sean Hert. Note the scaffolding on what might be a GUPPY in the background. 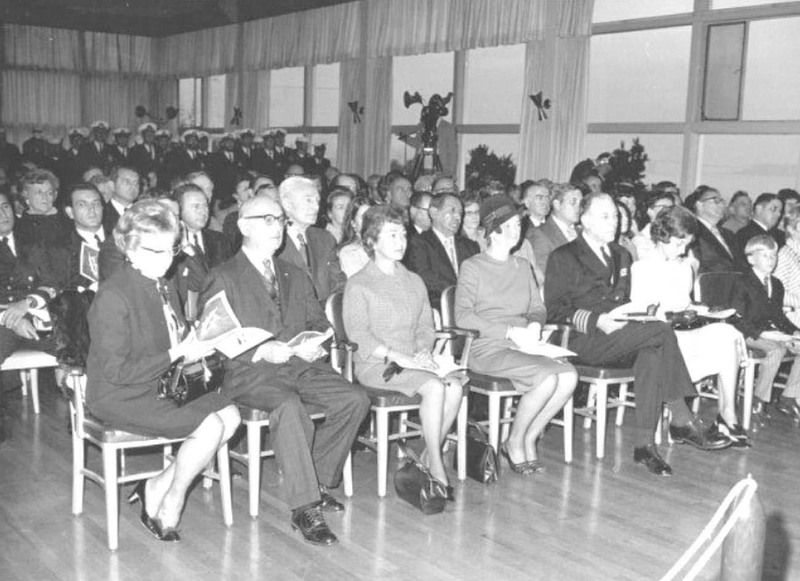 US National Archives photo # 80-G-1036029, from NARA, College Park, Maryland, courtesy of Sean Hert. 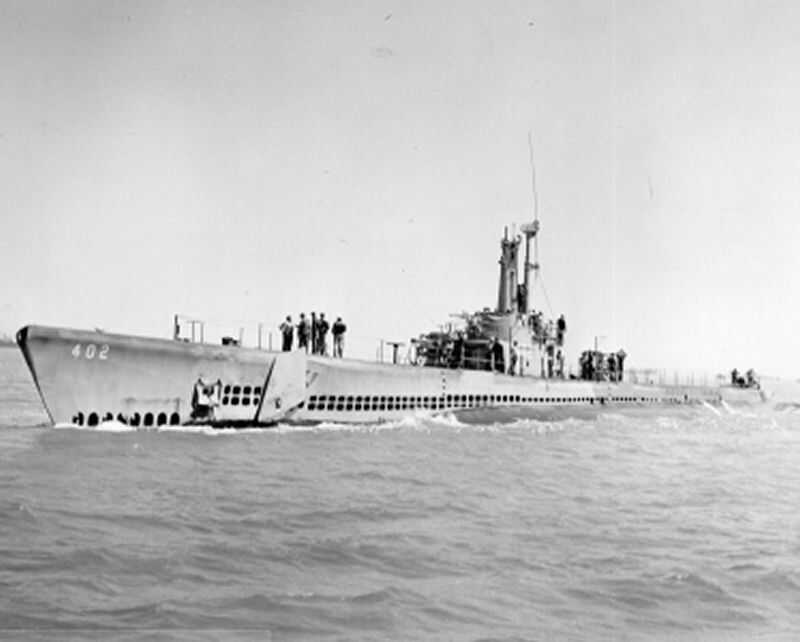 20k Sea Fox (SS-402), circa 1948, place unknown. USN photo courtesy of George M. Arnold. 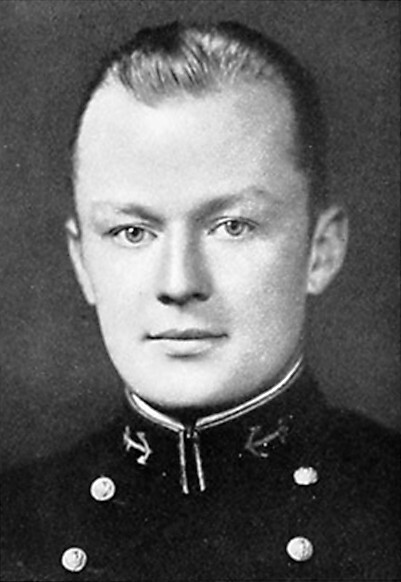 55k Cmdr Bricker Mcdowell Ganyard was the commanding officer of the Sea Fox (SS-402) from July 1949 to July 1950. USN photo courtesy of Lucky Bag yearbook via Bill Gonyo. 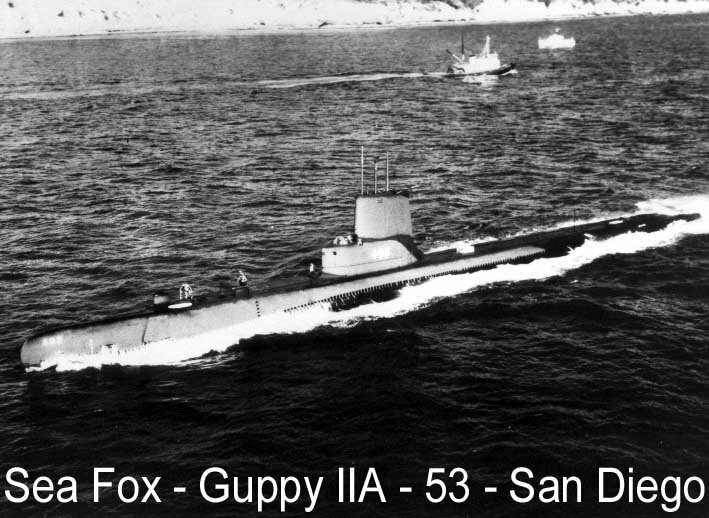 92k Sea Fox (SS-402), as a "Guppy IIA" submarine, underway at San Diego, CA., May 1953. USN photo courtesy of George M. Arnold. 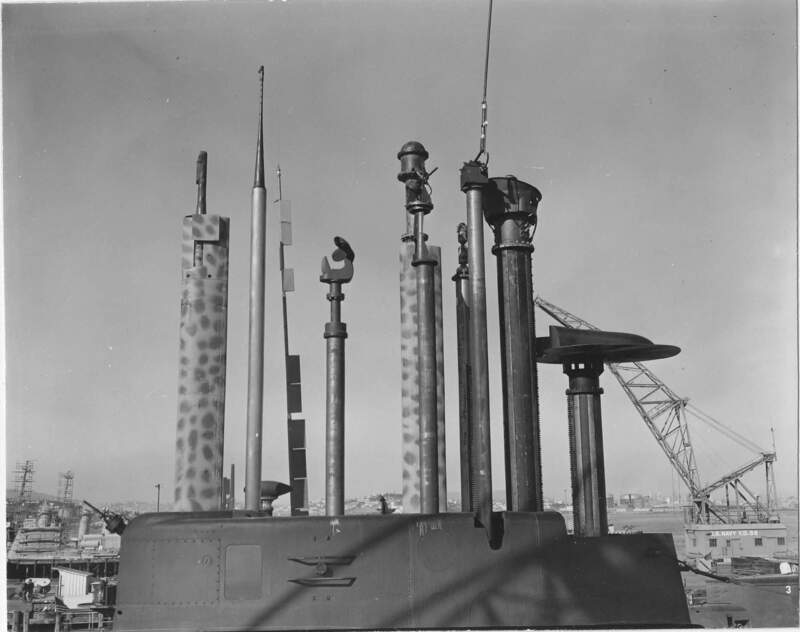 109k A view of the commissioning ceremonies for Sea Fox (SS-402) at Mare Island on 5 June 1953. 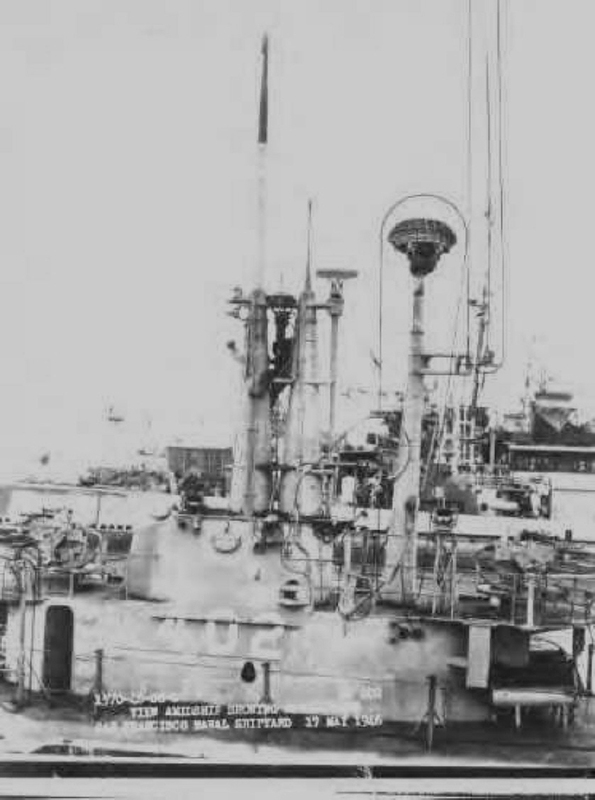 She was under conversion at the yard from 1 October 1952 to 5 August 1953. USN photo # 17774-6-53, courtesy of Darryl L. Baker. 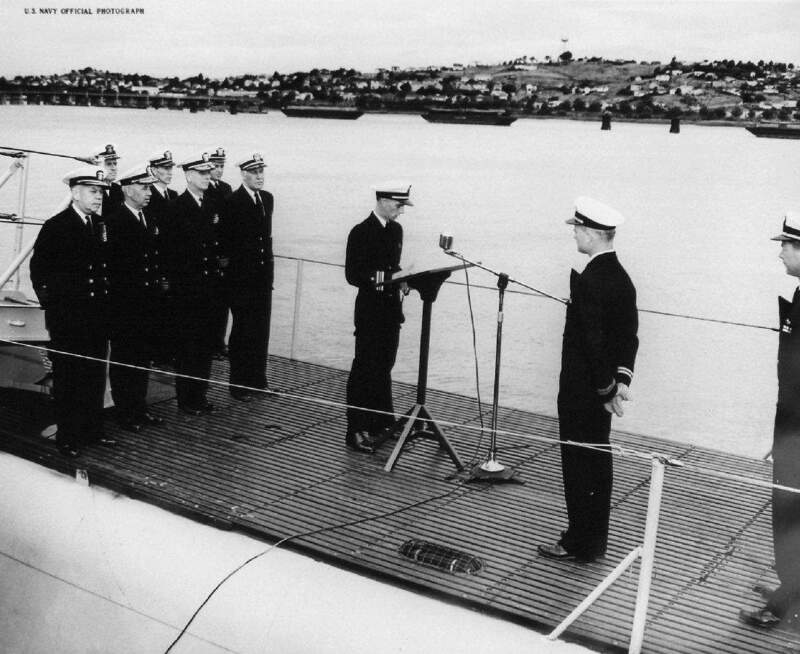 146k LCDR George S. Bennett, Jr. reads his orders as he assumed command of the Sea Fox (SS-402), at Mare Island on 5 June 1953. USN photo from the Vallejo Naval & Historical Museum courtesy of Darryl L. Baker. 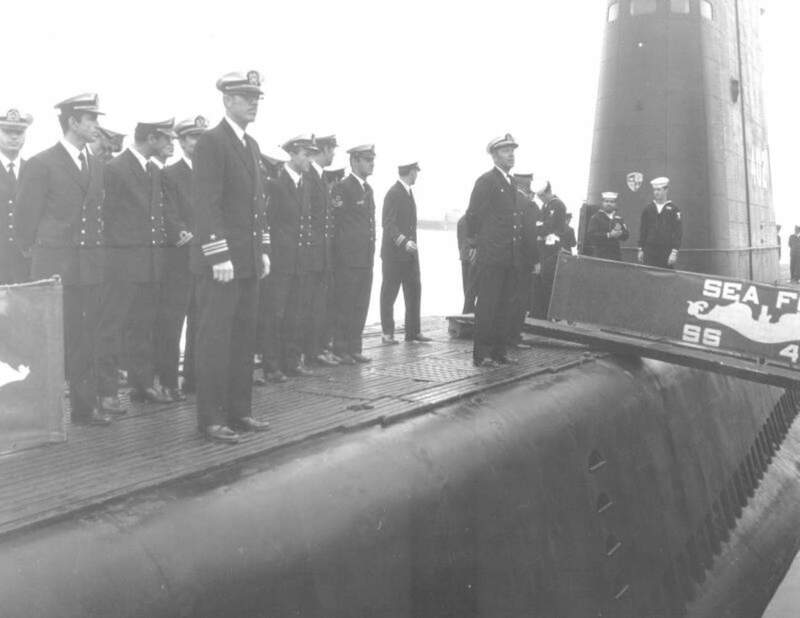 706k View of the re-commissioning of Sea Fox (SS-402) at Mare Island on 5 June 1953. 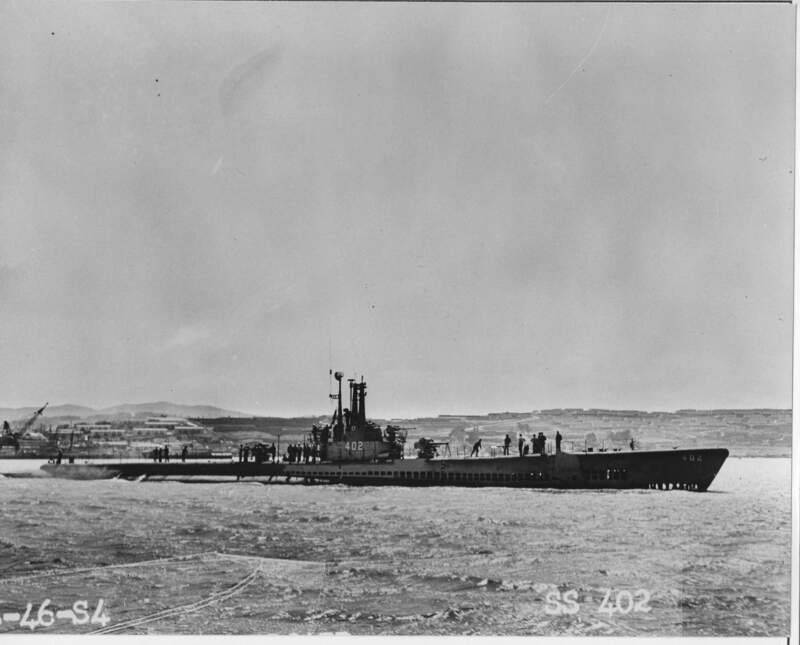 Submarine forward of Sea Fox is Menhaden (SS-377) with YRB-14 and YRB-12 outboard of her. USN photo # 17775-6-53 TH, from the Vallejo Naval & Historical Museum courtesy of Darryl L. Baker. 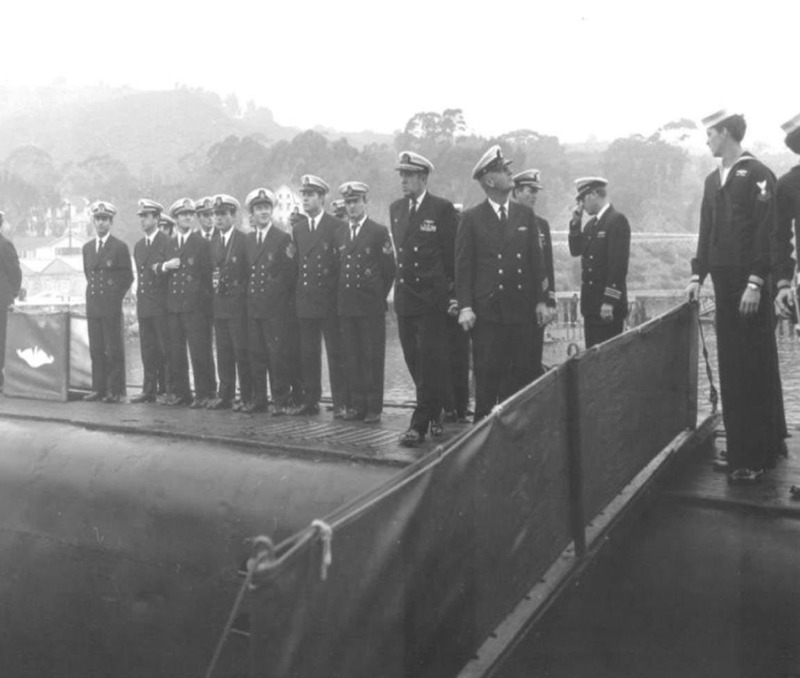 773k View of the Navy officials at the re-commissioning ceremonies for Sea Fox (SS-402) at Mare Island on 5 June 1953. Speaking is VADM Francis S. Low (Commander, Western Sea Frontier). 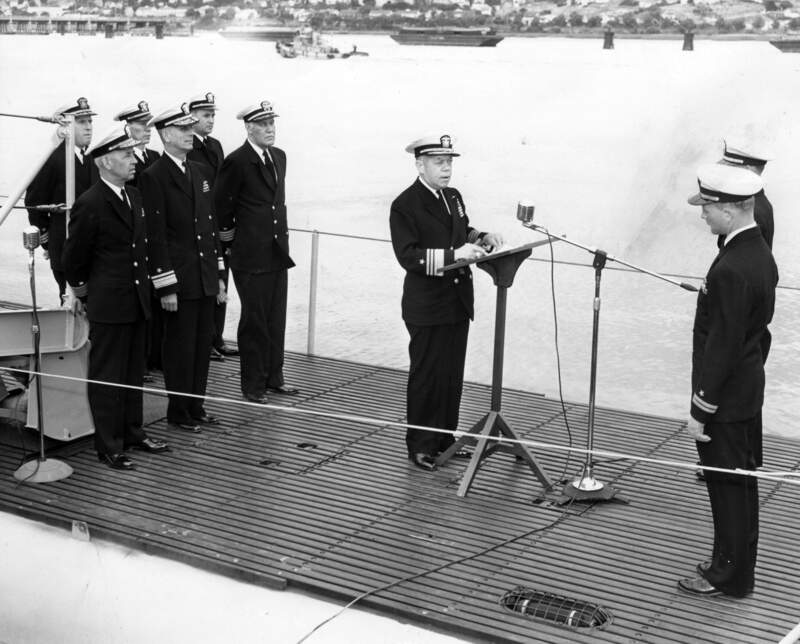 Others pictured are, left to right, first row: RADM Leon S. Fiske (Mare Island Base Commander), RADM A. M. Morgan (Shipyard Commander), Capt. W. T. Singer (Shipyard Admin Officer). 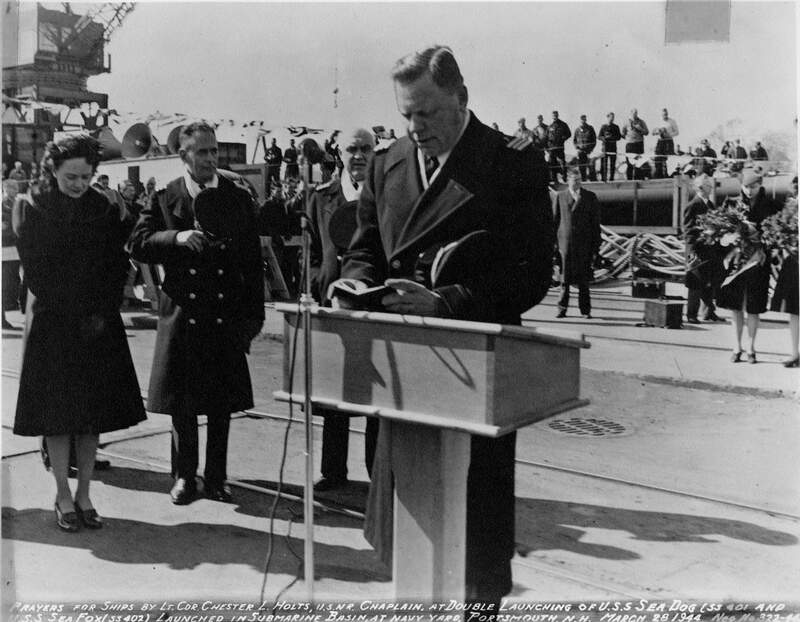 Rear row: CDR William Shifflette (aide to RADM Fiske), LTJG J. C. Cook (Aide to VADM Low), and LCDR Harold A. MacNeill (Shipyard Chaplain). USN photo # 17778-6-53 TH, from the Vallejo Naval & Historical Museum courtesy of Darryl L. Baker. 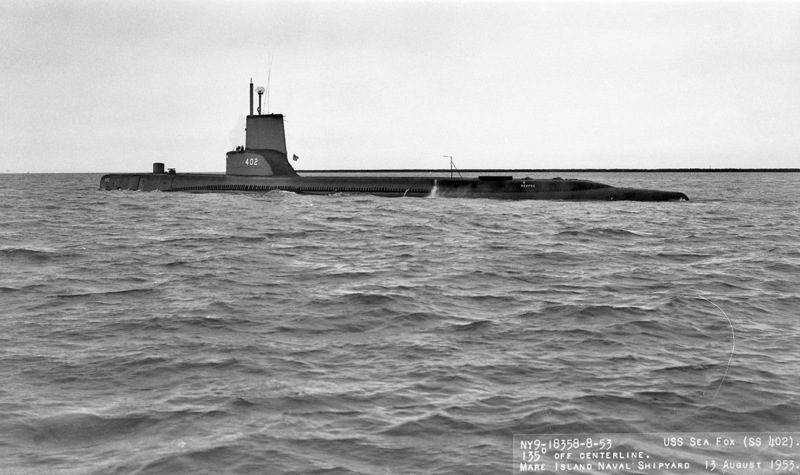 358k The Sea Fox (SS-402) is seen off Mare Island on 13 August 1953. USN photo # 18358-8-53, courtesy of Darryl L. Baker. 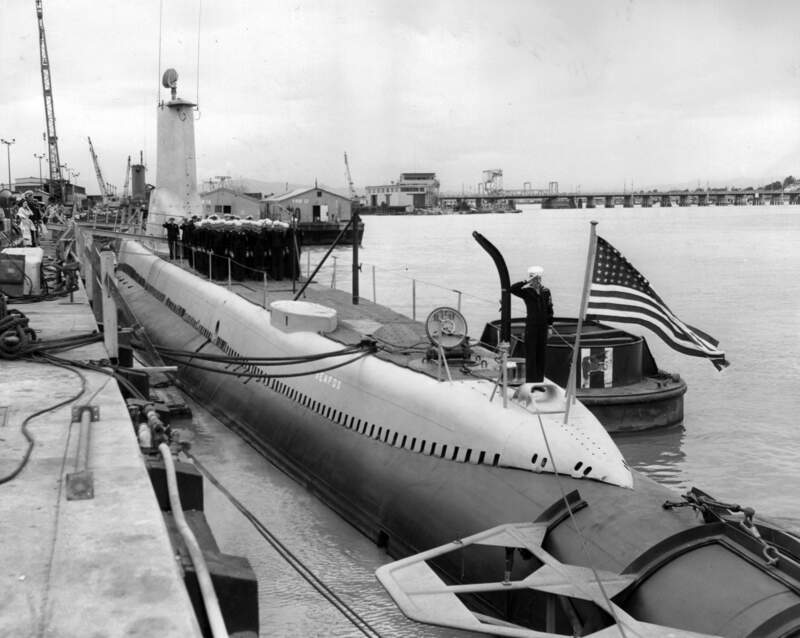 60k Sea Fox (SS-402) moored, Sub Base Pearl Harbor, HI, 1955. USN photo courtesy of George M. Arnold. 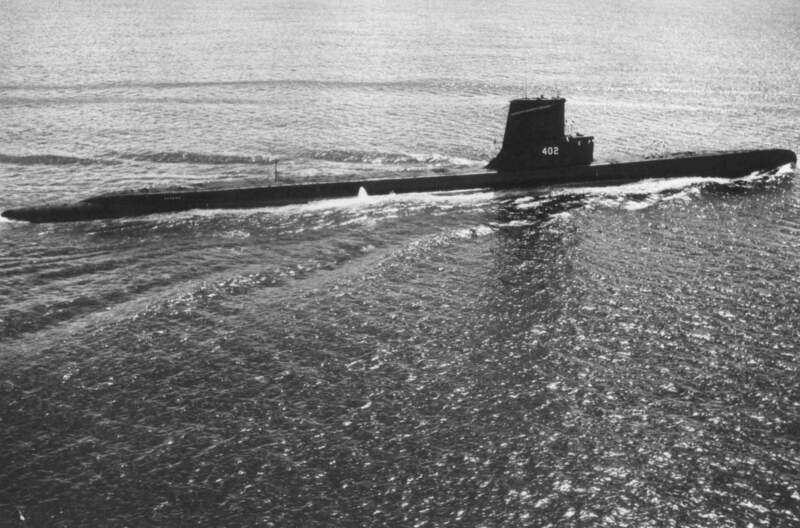 316k Sea Fox (SS-402) underway on 10 April 1961. She continued to rotate between training operations out of San Diego and duty with the 7th Fleet in the western Pacific. Text courtesy of DANFS. 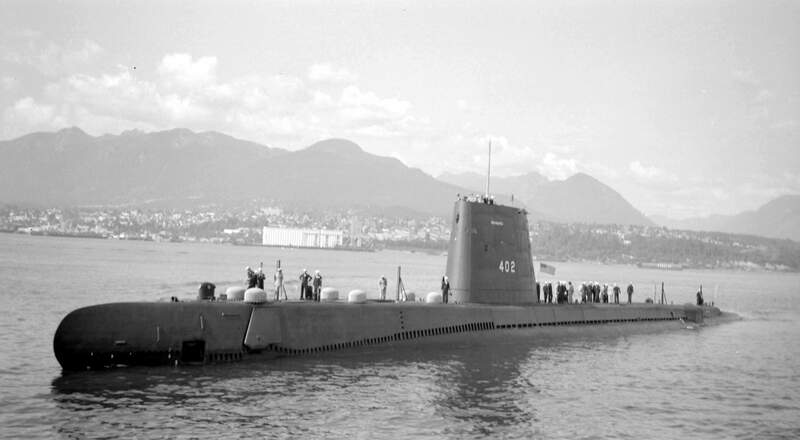 265k Sea Fox (SS-402) approaching Vancouver BC on 23 August 1963. Walter E. Frost Photographer. Source: City of Vancouver Archives, Photo No. AM1506-S3-3-: CVA 447-8055 via Mike Green. 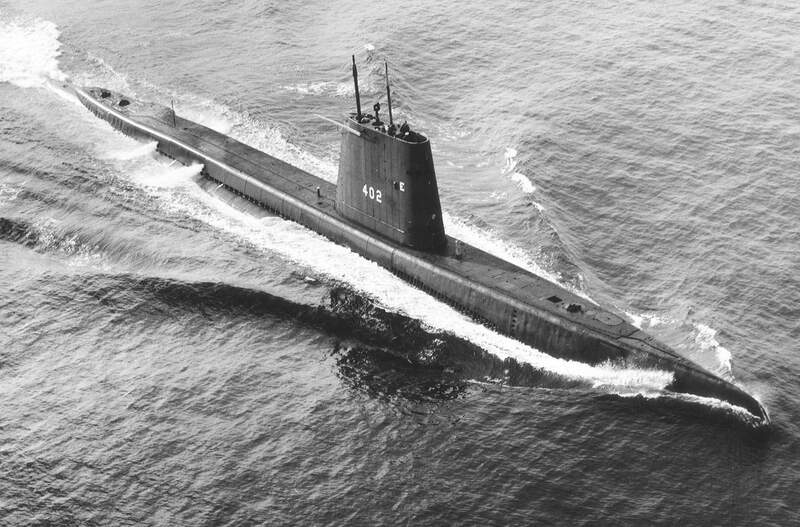 Menhaden (SS-377). Photo courtesy of Tommy Trampp. 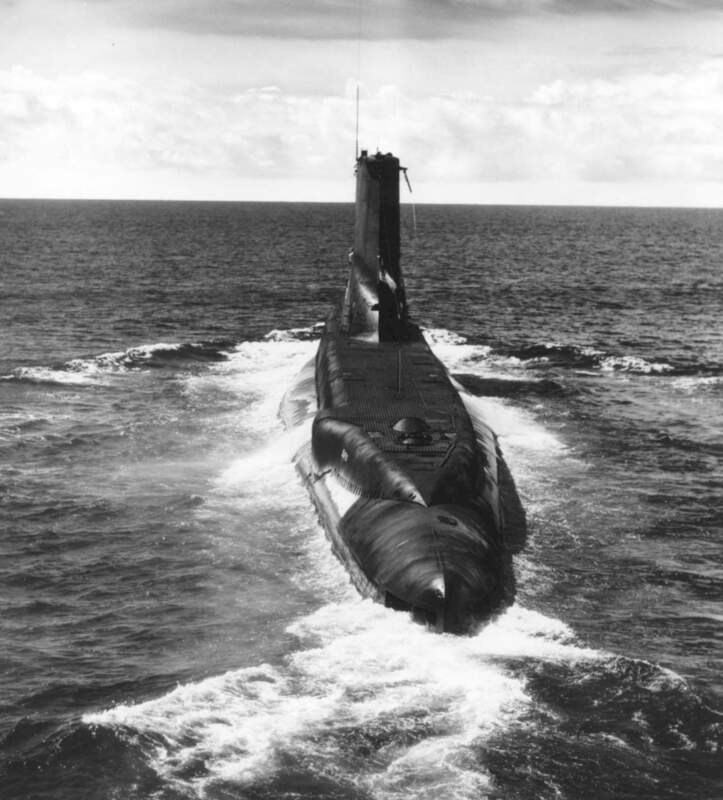 70k Sea Fox (SS-402) underway, circa late 1960's. USN photo courtesy of George M. Arnold. 46k Cover of Sperry (AS-12) Welcome Aboard pamphlet, circa 1968. Note she still carries MK 12/22 radar on her MK 37 gun director in this picture. 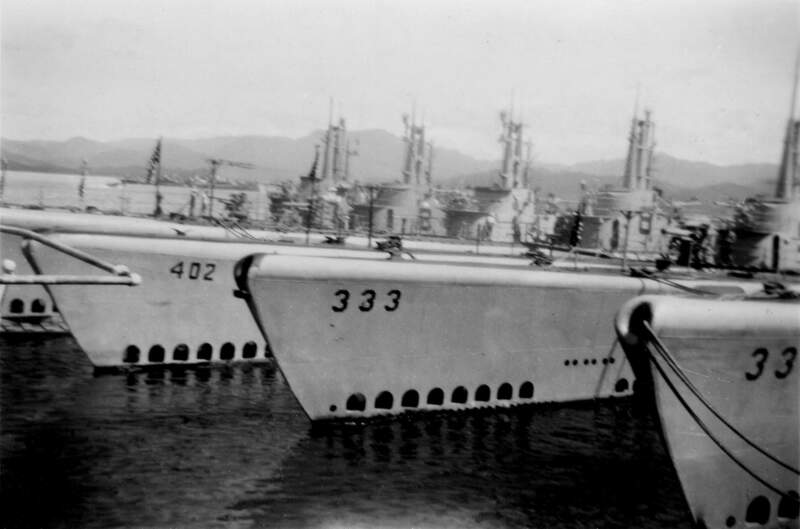 Submarines alongside include, from inboard to outboard Atule (SS-403), Bugara (SS-331) and Sea Fox (SS-402). Photo courtesy of David Buell for his father CWO4 Benton E. Buell USN Ret. 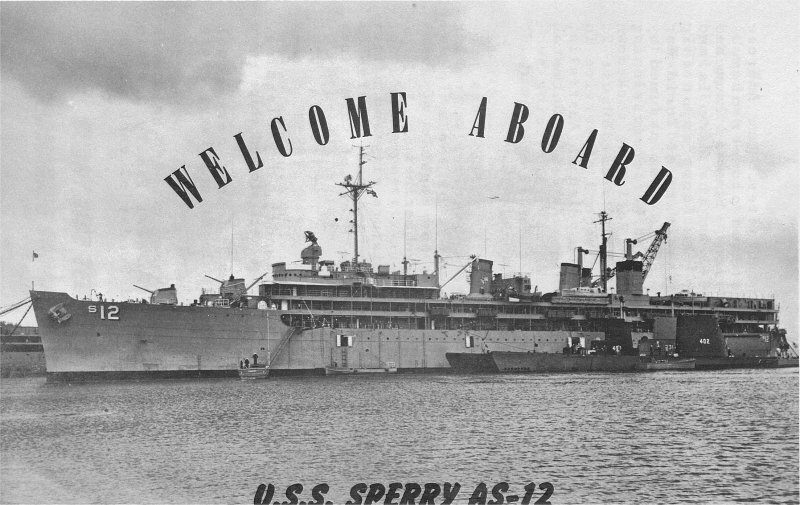 DCA USS Sperry 1968-69. 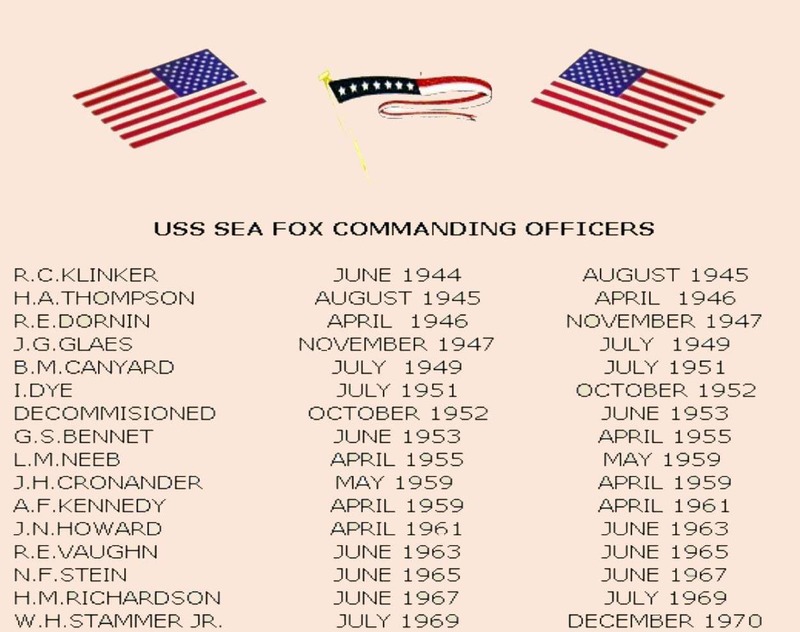 114k Former commanding officers of the Sea Fox (SS-402). Photo courtesy of Y.M.Umar, CPO (Ret. 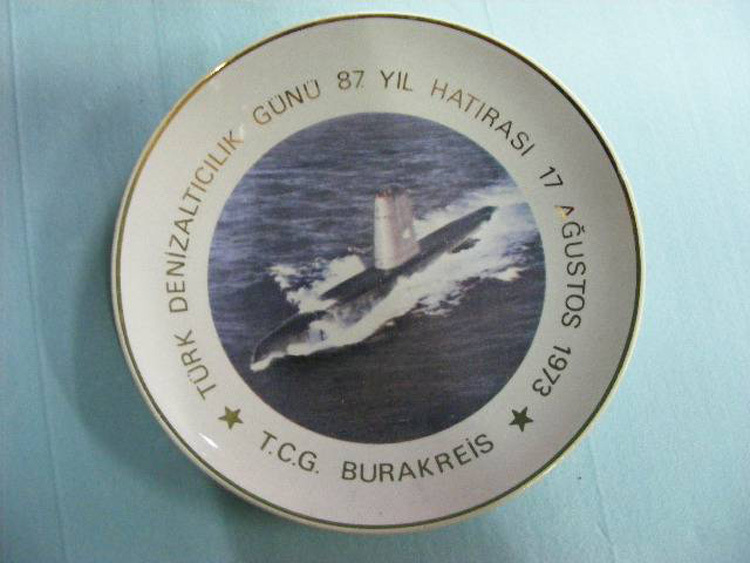 ),Turkish Navy. 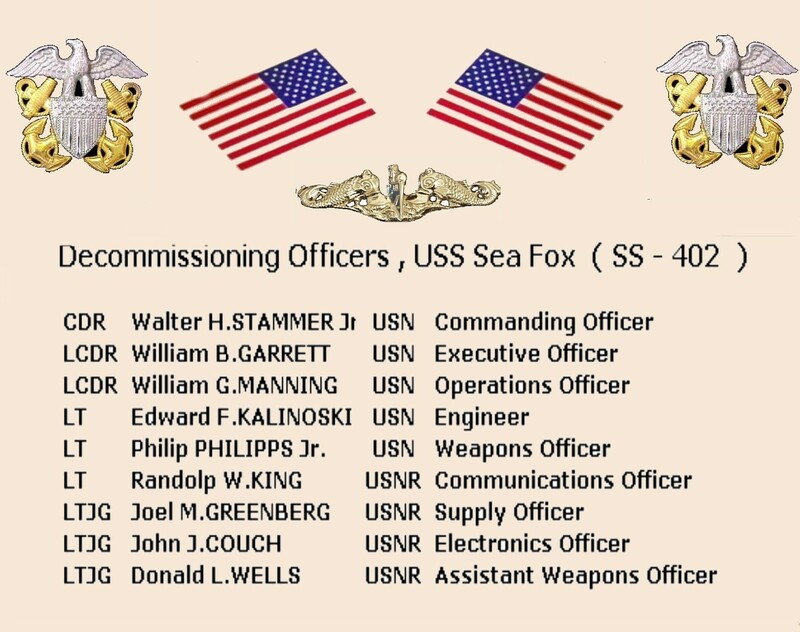 114k Decommissioning crew of the Sea Fox (SS-402). Photo courtesy of Y.M.Umar, CPO (Ret. ),Turkish Navy. 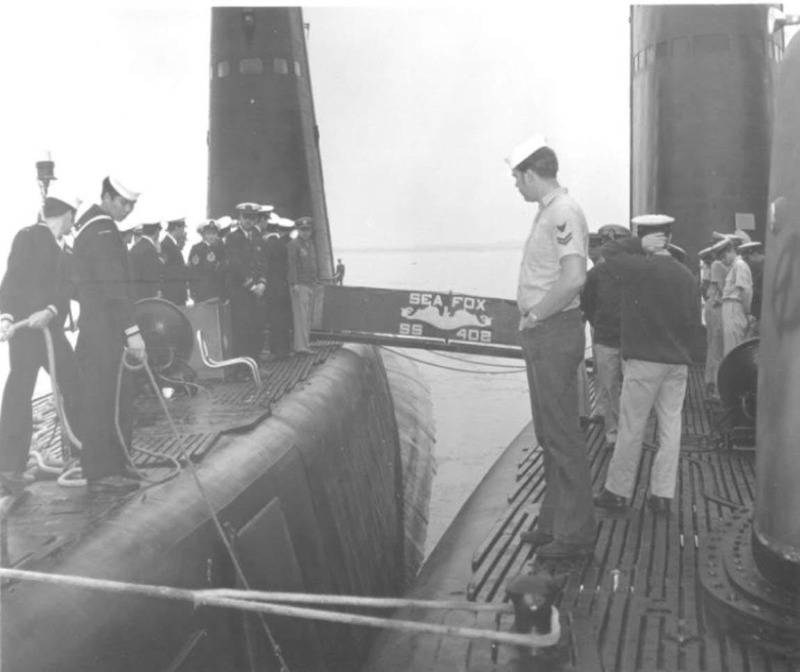 226k Decommissioning officers of the Sea Fox (SS-402), 14 December 1970. Photo courtesy of Y.M.Umar, CPO (Ret. ),Turkish Navy. 104k Program of Events for the Decommissioning Ceremony. Photo courtesy of Y.M.Umar, CPO (Ret. 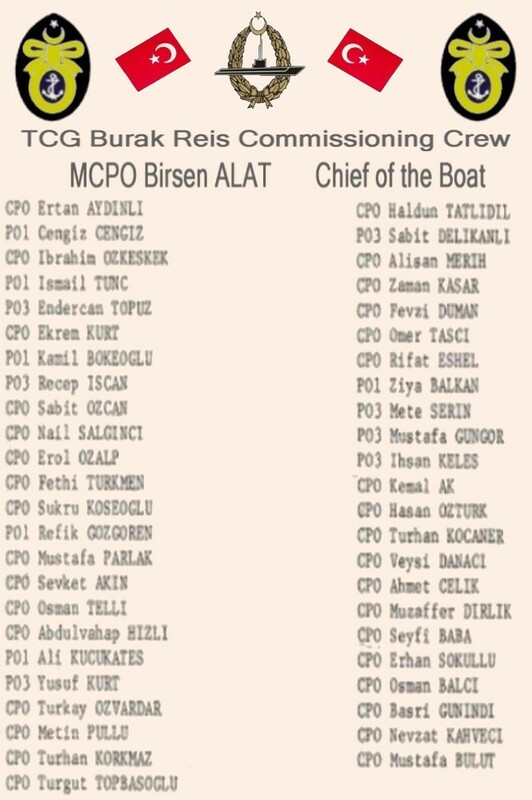 ),Turkish Navy. 71k The Official Party. Photo courtesy of Y.M.Umar, CPO (Ret. 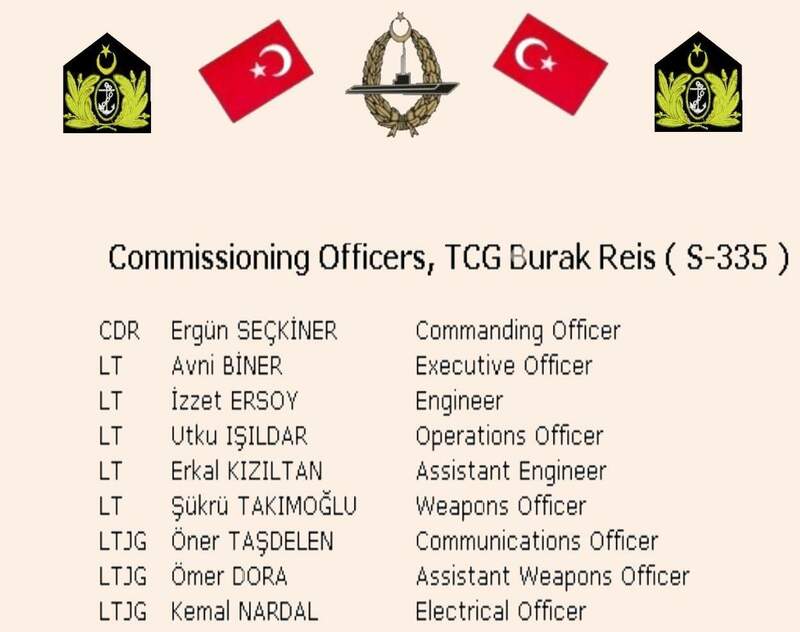 ),Turkish Navy. 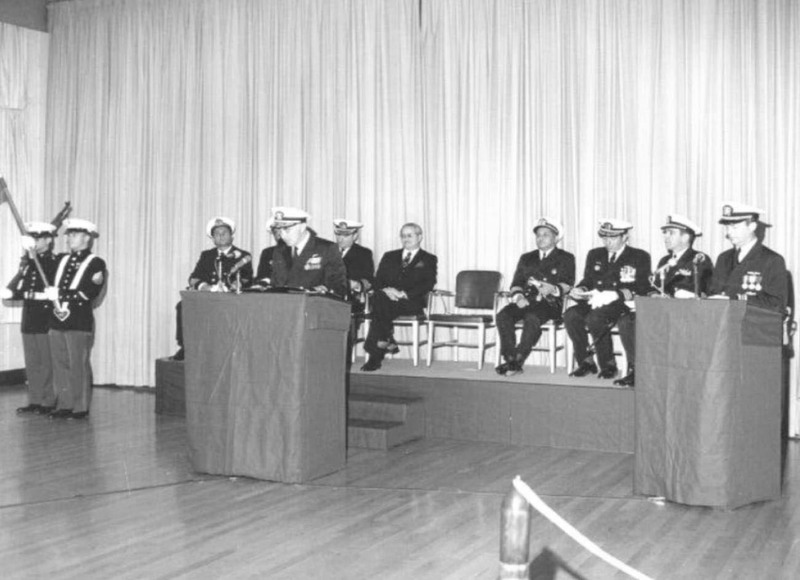 110k RADM Matter, Commandant of the 12th Naval District addresses the change over, 14 December 1970. Photo courtesy of Y.M.Umar, CPO (Ret. ),Turkish Navy. 142k Turkish Amb. 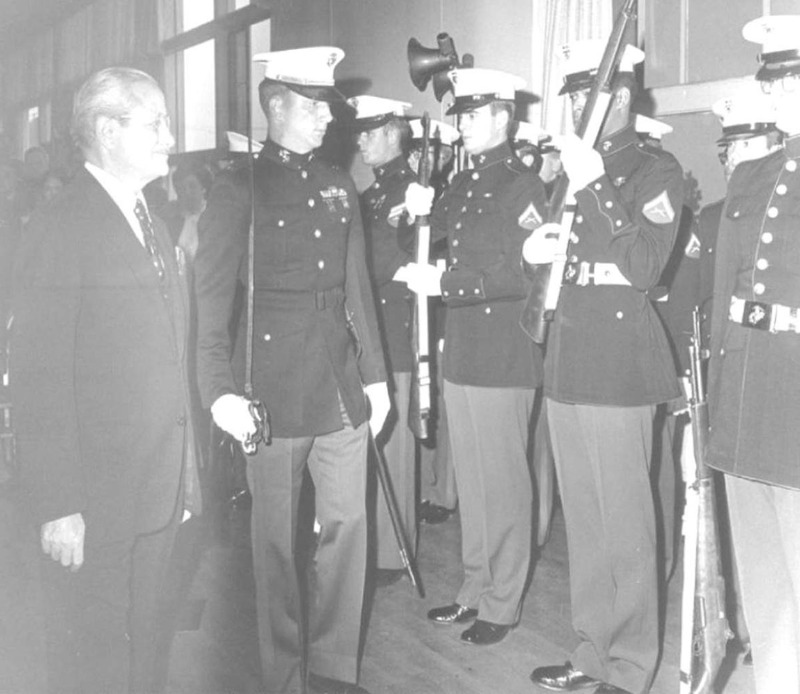 Inspects the Honor Guard. Photo courtesy of Y.M.Umar, CPO (Ret. ),Turkish Navy. 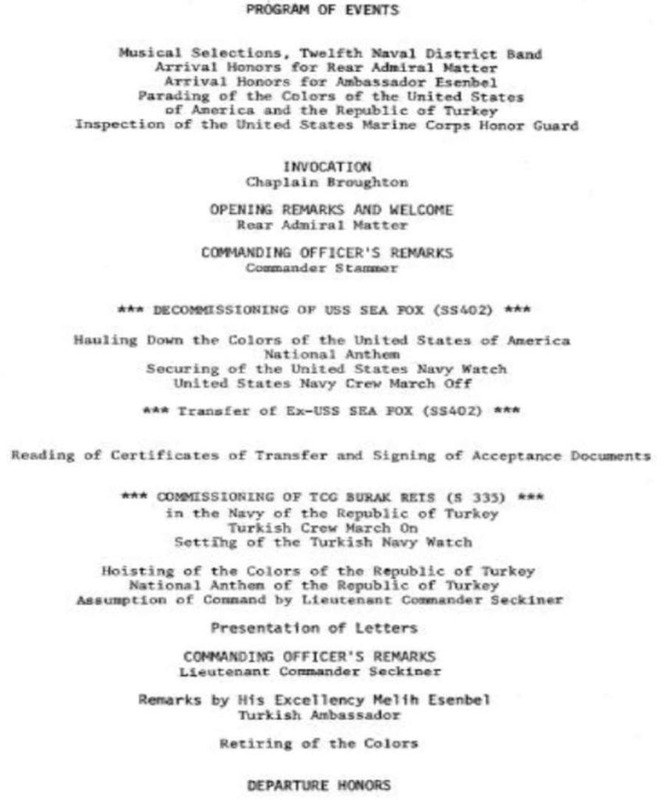 153k After finishing the Decommissioning Ceremony, U.S. & Turkish Officers share a final salute. Photo courtesy of Y.M.Umar, CPO (Ret. ),Turkish Navy. 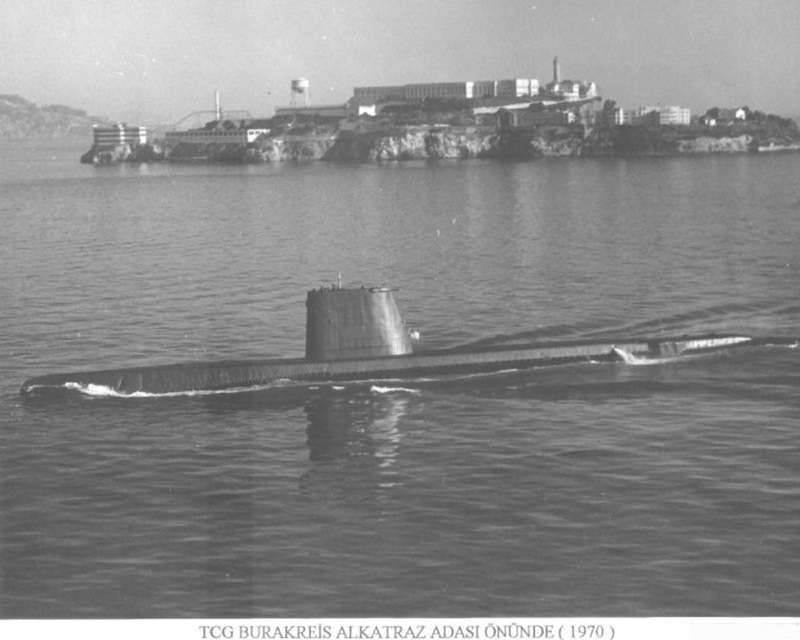 89k Preparing for turn over of Sea Fox (SS-402) to Turkey. Photo courtesy of Y.M.Umar, CPO (Ret. ),Turkish Navy. 142k Decommissioning attendees. Photo courtesy of Y.M.Umar, CPO (Ret. ),Turkish Navy. 100k CDR Sekiner and CDR Stammer exchange gifts. Photo courtesy of Y.M.Umar, CPO (Ret. ),Turkish Navy. 68k Commissioning ceremonial saluting of the National colors. Photo courtesy of Y.M.Umar, CPO (Ret. ),Turkish Navy. 68k Change over crew topside. Photo courtesy of Y.M.Umar, CPO (Ret. ),Turkish Navy. 125k The Sea Fox (SS-402) still inservice as a US vessel sometime shortly before her transfer to Turkey as the Burakreis (S-335) passes by the federal prison at Alcatraz. Photo courtesy of Y.M.Umar,CPO (Ret. ),Turkish Navy. Photo i.d. courtesy of John Hummel, USN (Retired). 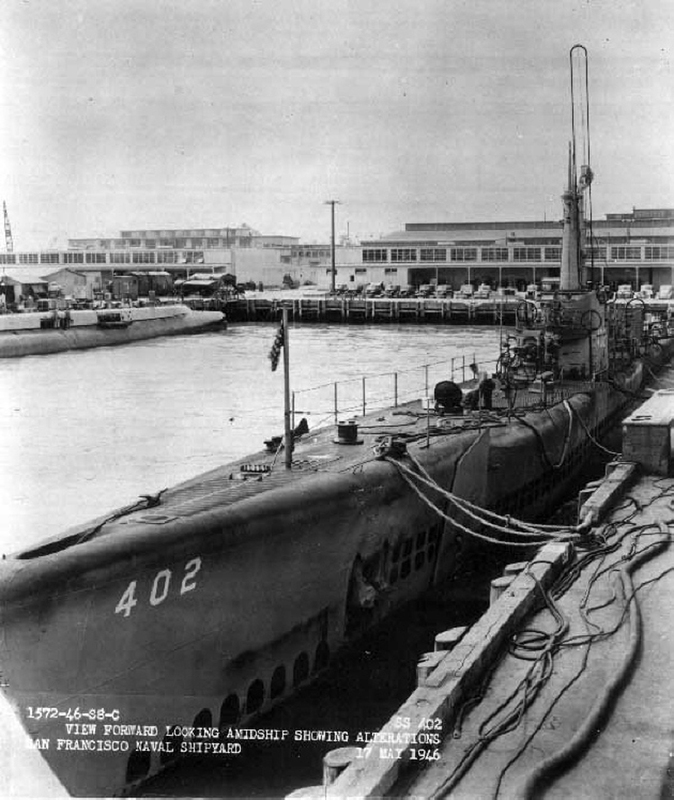 71k Aboard Sea Fox (SS-402) preparing for turnover to Turkey completing her transfer at Hunters Point, 14 December 1970. Photo courtesy of Y.M.Umar,CPO (Ret. ),Turkish Navy. 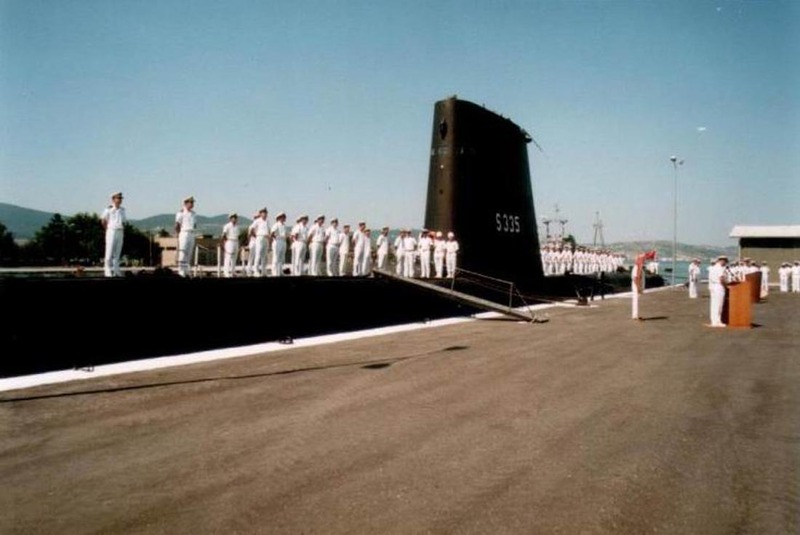 189k The final lowering of the flag of the ex-Sea Fox (SS-402) completing her transfer at Hunters Point, 14 December 1970. Photo courtesy of Y.M.Umar,CPO (Ret. ),Turkish Navy. 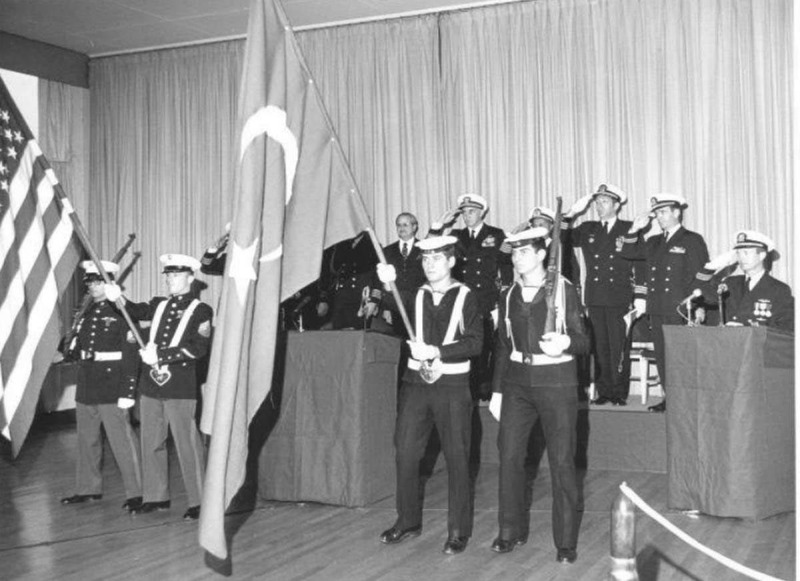 60k Front cover of the Decommissioning transfer ceremony of the ex-Sea Fox (SS-402) in Turkish Naval service as Burakreis (S-335), 14 December 1970. Photo courtesy of Y.M.Umar,CPO (Ret. ),Turkish Navy. 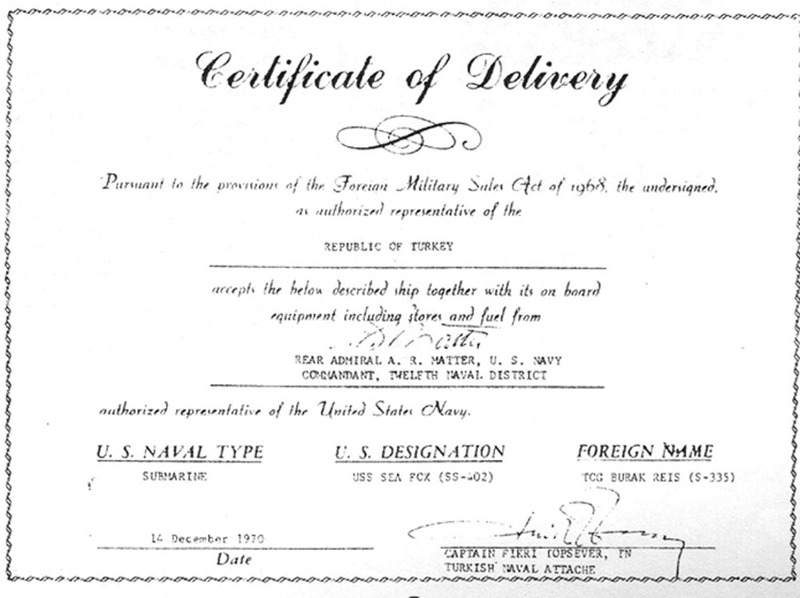 103k Certificate of delivery of the transfer ceremony of the ex-Sea Fox (SS-402) in Turkish Naval service as Burakreis (S-335), 14 December 1970. Photo courtesy of Y.M.Umar,CPO (Ret. ),Turkish Navy. 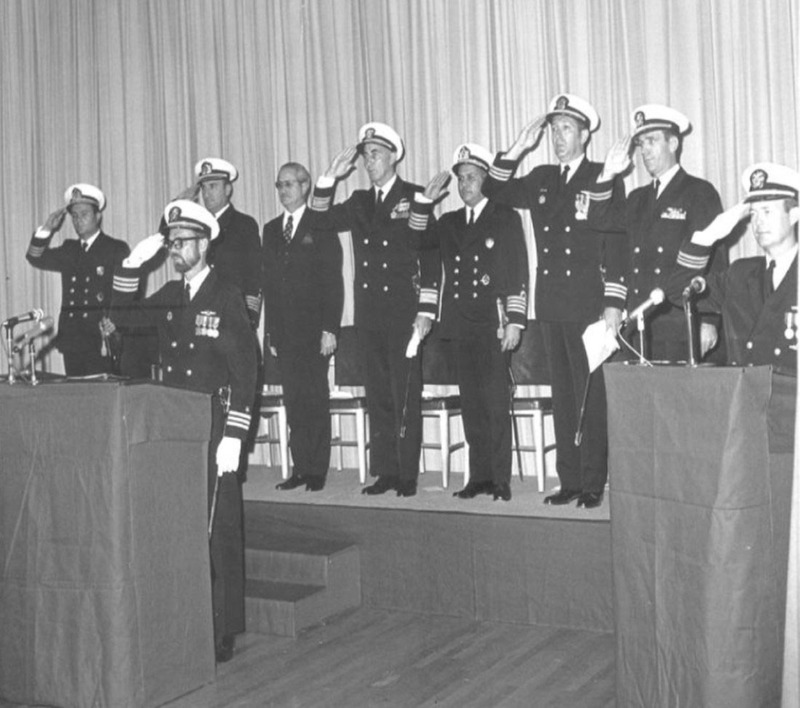 94k Commissioning officers of the Burakreis (S-335), 14 December 1970. Photo courtesy of Y.M.Umar, CPO (Ret. ),Turkish Navy. 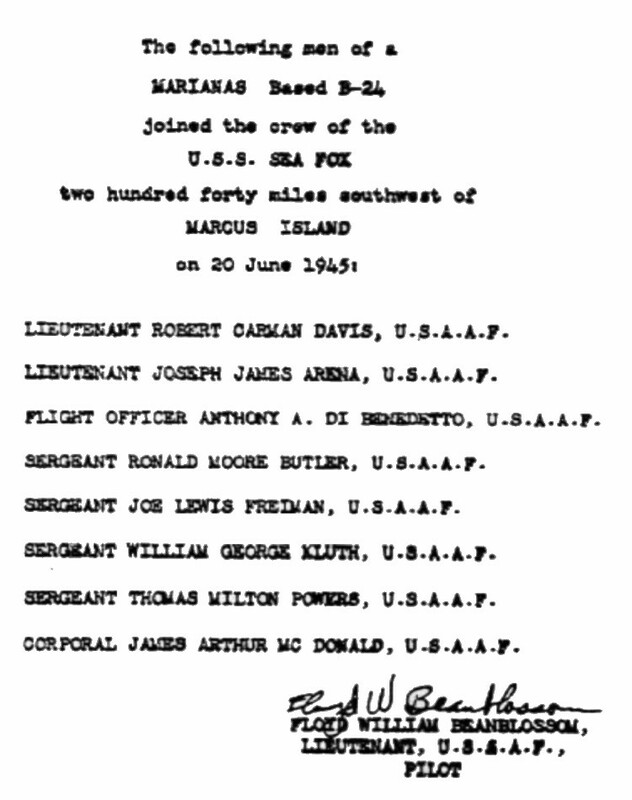 107k Non-Commissioning officers of the Burakreis (S-335), 14 December 1970. Photo courtesy of Y.M.Umar, CPO (Ret. ),Turkish Navy. 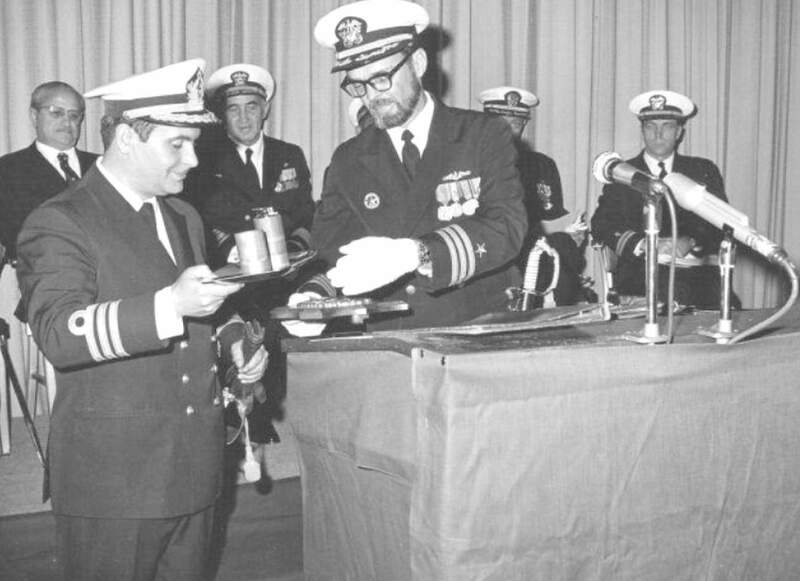 91k Commissioning crew December 1970 of the Burakreis (S-335), 14 December 1970. Photo courtesy of Y.M.Umar, CPO (Ret. ),Turkish Navy. 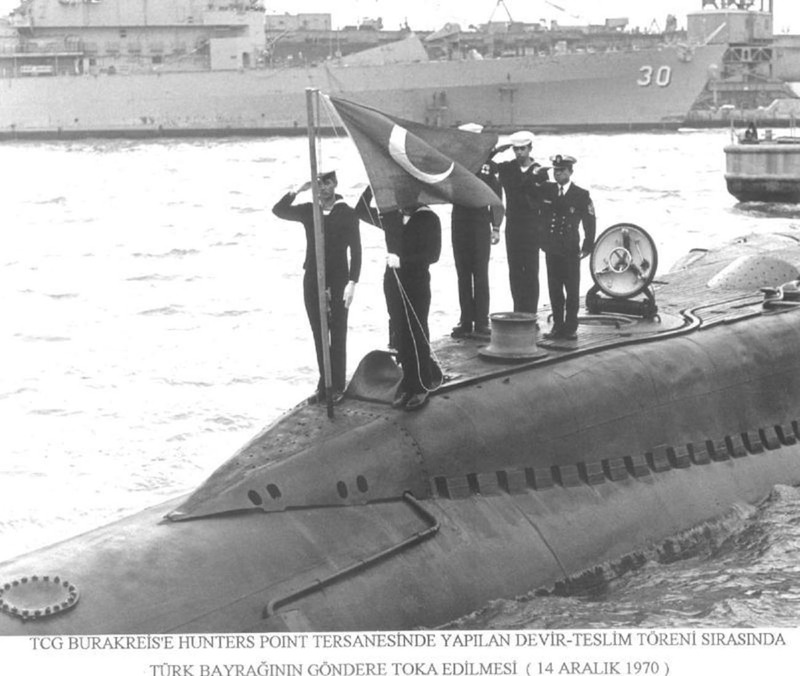 157k The ex-Sea Fox (SS-402) is welcomed into the Turkish Naval service as Burakreis (S-335), 14 December 1970 as her crew salutes the boat's new colors. Photo courtesy of Y.M.Umar,CPO (Ret. ),Turkish Navy. 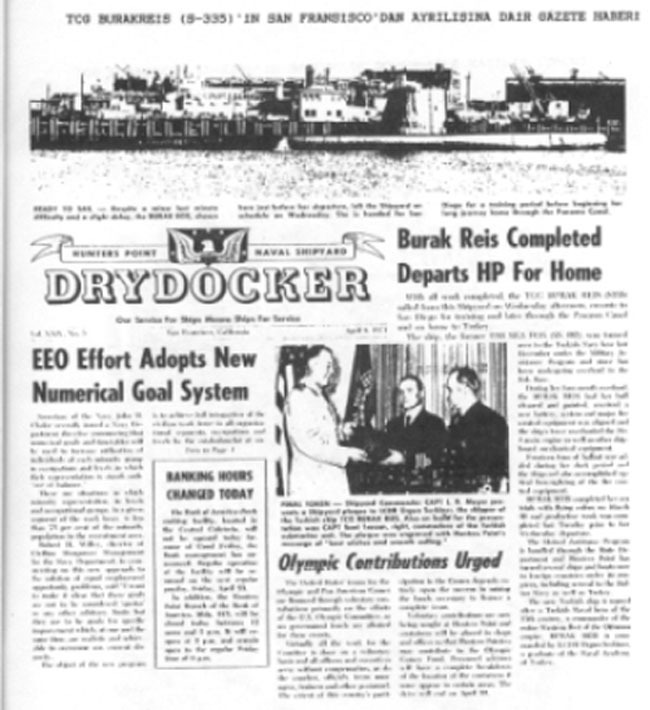 106k Front page of The Drydocker, newspaper of Hunters Point shipyard, showing the Burakreis (S-335) completing her transfer at Hunters Point, 14 December 1970. Photo courtesy of Y.M.Umar,CPO (Ret. ),Turkish Navy. 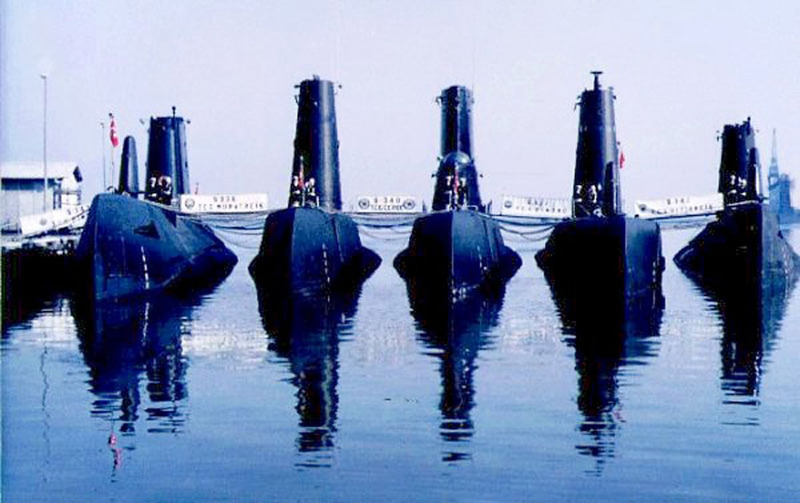 92k The ex-Razorback (SS-394) as the Muratreis (S-336) is the second boat on the left, middle boat is the Cerbe (S-340), ex-Trutta (SS-421), the ex-Sea Fox (SS-402) as the Burakreis (S-335) (2nd from right), with other Turkish subs; one of which is the ex-Tang (SS-563) as the Pirireis (S-343) and the other as ex-Gudgeon (SSAG-567), now the Hizirreis (S-342). Photo courtesy of Y.M.Umar,CPO (Ret. ),Turkish Navy. 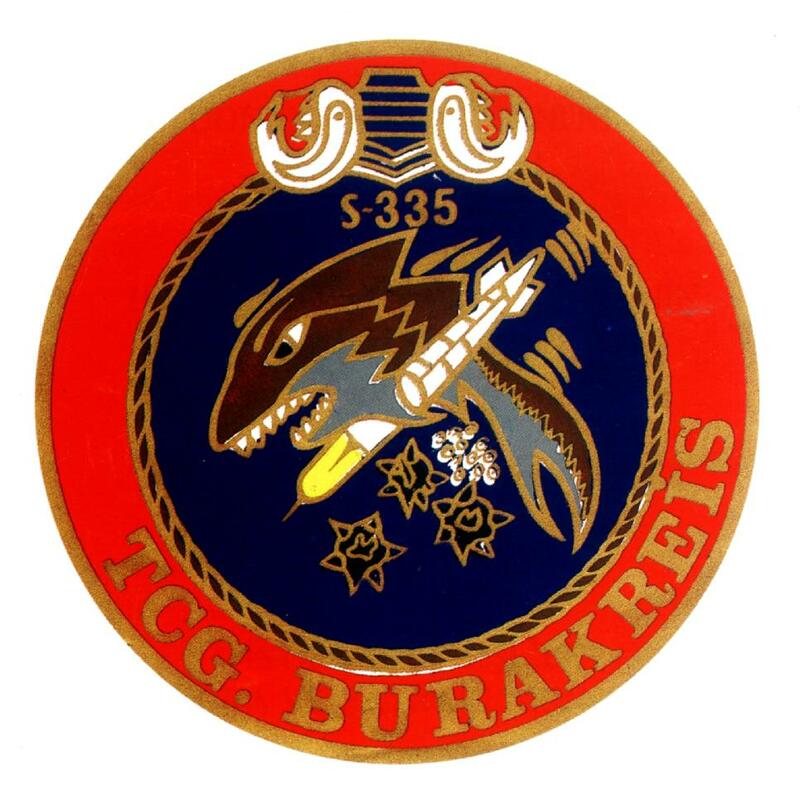 91k The Burakreis (S-335) returns back to the Sub base at Golcuk. Photo courtesy of Sait Kucuk, CPOS (Ret),Turkish Navy. 143k Burakreis (S-335) official crew photo, 1974. Photo courtesy of Sait Kucuk, CPOS (Ret),Turkish Navy. 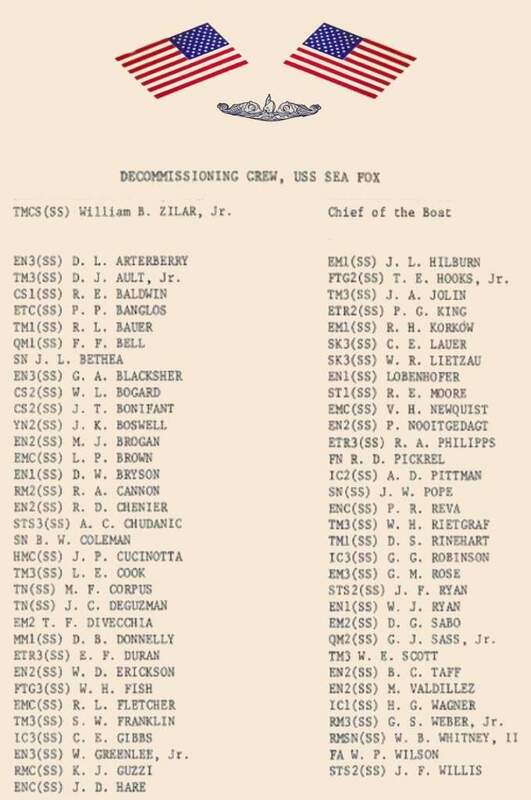 126k Sea Fox served for dinner aboard the Burakreis (S-335), 1973. Photo courtesy of George M. Arnold & Y.M.Umar,CPO (Ret. ),Turkish Navy. 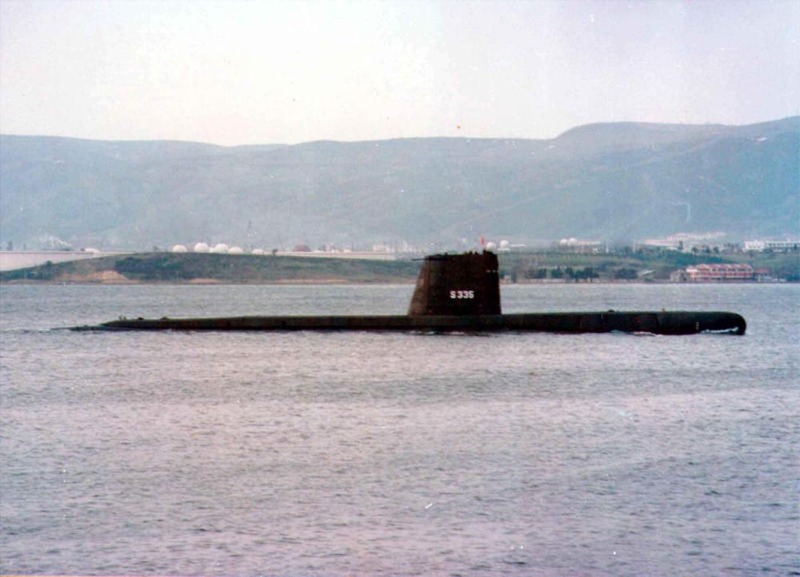 84k The Burakreis (S-335) decommissioning from Turkish Navy, 1 July 1996. Photo courtesy of Sait Kucuk, CPOS (Ret),Turkish Navy. Problems and site related matters, E-mail Webmaster.